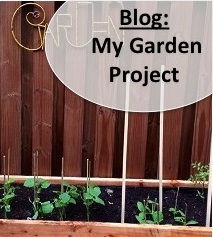 Welcome to my ambitious attempt to chronicle my adventures in growing food, AKA gardening. Growing up, my father loved to be outside building and growing things, he still does. He is an engineer who loves to use his brain and his hands. Naturally, I always was bugging him to help, which usually had a couple of very undesirable outcomes. Those quick projects would end up taking 2 or 3 times longer despite all my "help". My father's blood pressure would soar through the roof when I would "playfully" hit him with a hammer instead of the nail (I was surprisingly strong as a child) or when I would proudly show him all the "weeds" I pulled leaving only the pretty flowers I liked (I love nature, but my motto was "if you're not pretty, you are a weed"). Both my dad and I are lucky that he has a lot of patience so he didn't develop an ulcer and I got to learn first hand how to become a home project expert (more in spirit than in reality). So, flash forward to 2-3 weeks ago: I had been talking and talking about how I wanted a garden. My whole life I literally said, "Once I have a house of my own I want to grow my own food". Interestingly enough I purchased my first home last August and despite my resounding belief that every homeowner should have a garden, I neatly tucked that belief away because all the other projects were way more important to tackle. So that brings me to mistake number one, my priorities: On the list of things that are important to do when you buy your first home, I get it, building a garden seems like a leisurely thing people who are bored do when everything else is finished. That is, unless you have been living with the dream of a little piece of self sufficiency. To me, that is what growing your own food is, a small step towards self sufficiency and taking back control. When you buy produce from the grocery store your hands are tied. Sure you can choose between organic and non organic, but other than that, what else do you really know about the food you are putting in your body? Do you know how long it has been since the fruit or veggie (F or V) has been plucked from its plant (nutrient content decreases steadily after a F or V gets picked) or if the soil used to feed these plants actually has sufficient nutrients in it? These are just two examples of how little control over the quality of our produce we truly have when we shop at the grocery store.